floral print dress: Lovely floral look. 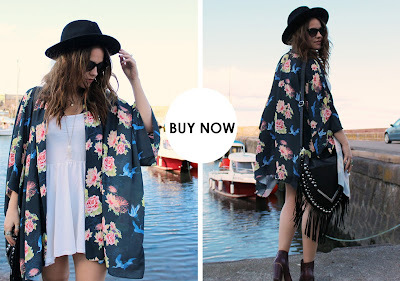 How to wear kimono jacket. Lovely floral look. How to wear kimono jacket. These flowy toppers achieve that perfect hybrid between elegance and ease, with Asian-inspired flowers and prints, fringe trim, even the solid-colored options in a standout hue. We love wearing kimono jackets because if you’re wearing a singlet, they protect your arms from the lower temps but don’t let you overheat in the meantime. They’re also a great way of dressing up a simple outfit – particularly because they’re such an unusual shape, and you can get them in so many different prints and colours. And to top it off, if you’ve got a bit of tuckshop-mumma arms happening (also known as Bingo Wings), they cover the problem areas in a way that doesn’t require you to whip out the forbidden skivvy.